Katherine Tegen Books, 9780062398604, 368pp. This action-packed fantasy novel about two siblings and the fractured world they inherit when they are adopted by a grieving queen is the stunning sequel to The Silver Gate. Wynn and Elric may now be safe, but adjusting to life in the Between is not without complications. Their adoptive mother, the benevolent Fairy Queen, is haunted by the memory of her child who was kidnapped long ago—and she won’t risk letting the same thing happen to Wynn and Elric. But that same grief has been weakening the queen’s powers for years, and the protective shield around their kingdom is deteriorating. Wynn is coerced into the Nightfell Wood by a creature sent to do the Grendel’s bidding, Elric knows he must go after her to save her life. What they discover there—about fear, prejudice, and the true nature of evil—will change the fairy kingdom forever. 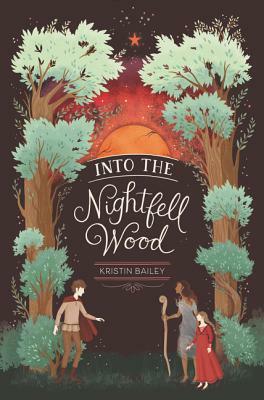 Kristin Bailey is the author of Into the Nightfell Wood and The Silver Gate. She grew up in the middle of the San Joaquin Valley in California. In the course of her adventures, she has worked as a zookeeper, balloon artist, and substitute teacher. Now she writes books for tweens and teens who enjoy magic and adventure as much as she does. Learn more at www.kristinbailey.com.